Max Pottag's methods, exercises, and excerpt books have been the foundation of many hornists' studies. He was also one of the first to write for and lead large horn ensembles, including 148 horns at the first horn workshop in 1969. Pottage was born in Forst, Germany in 1876. He started music with a toy violin at age five and the accordion at seven. He took up trumpet at 14, playing in the city band as an apprentice and changing to horn after a year. At 19, he joined the band of the German Navy in Wilhelmshaven and traveled extensively with Kaiser Wilhelm on his private yacht. In 1899, Pottag entered the Leipzig Conservatory as a scholarship student, studying with Friedrich Gumpert, and graduated with honors in 1901. He played first horn with the Hamburg Symphony for a short time before emigrating to the US. In the US, Pottage became second horn in the Philadelphia Orchestra (1901-1902), Pittsburgh Orchestra (1902-1905), and the Cincinnati Symphony Orchestra (1905-1907). 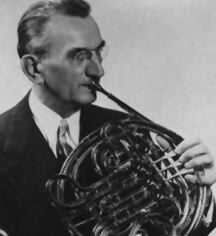 He was a member of the Chicago Symphony for 40 years (1907-1947), playing second horn until 1944, then fourth horn until his retirement. While in Chicago, he was also associated with the Little Symphony Orchestra of Chicago and taught horn at Northwestern University (1934-1952). He gave clinics and conducted large horn ensembles all over the US. Pottag wrote and arranged music for the horn throughout his life. His three volumes of excerpts was one of the first compilations of the standard orchestral horn passages in the US, an invaluable aid to generations of horn students. His publications also include daily exercises, a method book with Nilo Hovey, and numerous arrangements for horn and horn ensemble. He wrote articles on various aspects of horn playing in The School Musician, The Instrumentalist, Symphony, and Woodwind World. Pottag designed a horn for Reynolds, with a design similar to the Holton Farkas model, that was known as the Pottag Model. He also helped redesign the Conn 6D and developed several mouthpieces for each company. Pottag was honored as an honorary member of Pi Kappa Lambda and the Horn Club of Los Angeles. He was cited by Ball State University (Muncie IN) as "Master Musician, Master Teacher, Teacher of Master Teachers." Pottag was a founding member of the IHS and was elected an IHS Honorary Member in 1974. A tribute appears in the Fall 1971 issue of The Horn Call.